Bluetooth headphones are hot right now, and with good reason – the idea of doing away with tangled cords and limited range is virtually all win. But even with that cords free convenience, true music lovers are not going to be content to sacrifice sound for freedom, and its got to be able to stand up to everything our busy lives dish out. 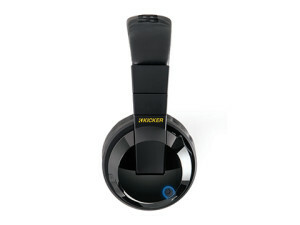 The right headset has to have it all – comfort, convenience, durability, and of course, kickin’ sound. Tabor bluetooth headphones from Kicker promise to give buyers all that and more, but are they really the headphones you’re looking for? We put them through the paces to see if they can really deliver consistent sound, value, and comfort – and we were pleasantly surprised at the results. While there were a few mild annoyances, for the most part the Tabor headphones are a great headset that has a lot to offer to music lovers, gamers, and anyone who wants great sound on the go. At first glance, the Tabor has a sleek design that, while it is far from low profile due to its rather bulky size, offers a fairly understated look. 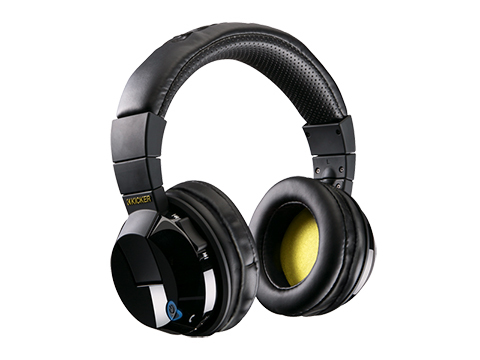 Most of the headphones are matte black in color, from the band across the top to the generously sized ear cups, with some understated accents in shiny black and deep yellow that add just a bit of interest to the design. The Kicker logo is stitched across the top of the headband in black thread, a nice touch that isn’t overly in your face. Going with a simple and easy to use design, the Tabor has only a few buttons to master to get the full potential from your headphones. It’s super simple to use, and everything is placed in logical places to make using them pretty intuitive. 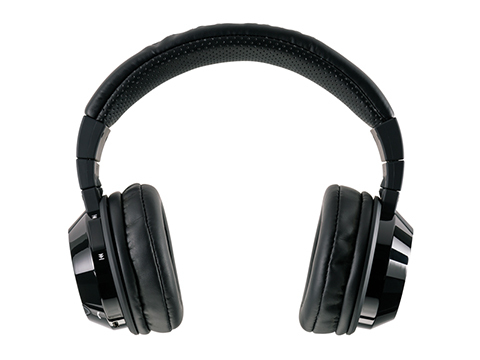 All of the buttons are on the right ear phone – a logical and easy to use choice for the majority of users. While us lefties might like to see a left handed option, having everything in one place makes for a lot less fumbling as you try to remember which buttons are on which side. The power button is placed towards the bottom of the ear phone, and it glows bright blue when connected, and flashes blue when searching for a connection. This also doubles for answering your phone. When a call comes in, the music switches off automatically, and you can press the power button to answer and again to disconnect, at which point the music will start right back up for you – no actual interaction with the phone needed, and super convenient. Above the power button is a rocker button that allows you to change songs, again without every touching your phone or tablet. To the back is another rocker that controls volume – for best results, just turn the volume on your phone all the way up, and adjust through the headphones until it’s to your preference. All of that is pretty much exactly how you’d expect it should be, and you’ll have it all mastered in seconds flat – I love a device that doesn’t require research to use properly. My one annoyance is with bluetooth pairing, but even that is only an issue in certain situations. The Tabor can only be paired with one device, which means that if you want to use them on a different device, you’ll actually have to go in and forget them on the first device. For the most part, it’s not an issue as most of us like to stick to our main device, but it can be annoying when you want to switch to something else. Other devices literally don’t even register the Tabor unless it’s been forgotten by all previous devices. Of course, you don’t have to use bluetooth to use the Tabor, which makes it very adaptable to different situations (and helps out with the whole only able to be connected to one device thing as well). The included cord can be used to connect it to devices manually. The cord is generously sized, flat for less tangling, and soft to the touch. It’s a bright yellow color, and has included in line buttons and a microphone, making the Tabor a headset that can serve for all your needs. And when the cords is connected, it doesn’t use up any battery either, a plus for long trips where even the very robust 9+ hour battery life might not be enough. The Tabor is easy to use, and the sound is excellent – 54mm drivers and aptX Lossless codec ensure that. But how does it feel? For those of us who sport headphones most of the time, comfort is a must, and the Tabor will blow you away in that department. 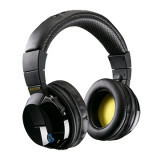 These are hands down some of the most comfortable headphones I’ve ever worn. They are surprisingly lightweight, given their size, and oh so soft. The thickly padded headband has luxurious buttery soft leather look and feel. The ear cups are just as generously padded, with a soft foam inside to ensure your ears stay cool and comfortable during long wearing sessions. Tabor Bluetooth Headphones have a lot to offer to music lovers, gamers, commuters, and anyone who wants great sound on the go. With an ultra comfortable design, exceptional sound, and a robust battery life, it has everything you need to keep connected and keep moving, with no cords to tie you down. I love mine over all the $100. ones I’m hard hearing but the quality blew me away. second time I went to use them with my Bluetooth mnxo nothing! but, i see now it was because I paired another headphone to the BT gonna fix that shortly. For me also great comfort, my others squeeze my head in a vice. Igive them 4 stars. The $350 pair would possible get that from me. Isee no lag in the sound with the lips.